« Global Diversity of Lap-Chee College Presents: Slam & Jam Night! 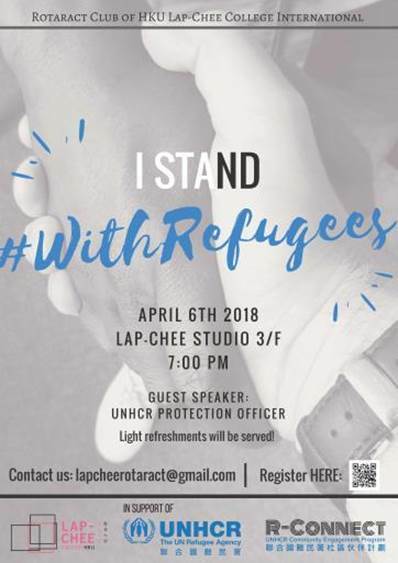 The Rotaract Club of HKU Lap-Chee College International is pleased to announce a collaborated event with the United Nations High Commissioner for Refugees, UNHCR. The event aims to raise awareness of the challenges and struggles the refugees face in Hong Kong and around the world. We are pleased to invite an important dignitary representing the UNHCR to talk to us about the severity of the issue. There will be opportunities to ask questions and discuss valuable ideas. Light refreshments will be provided.